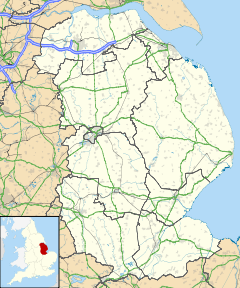 Bottesford is a historic village with town status, due to its town council, in North Lincolnshire, England. The town is joined to southern Scunthorpe, and is defined by the B1501 road to the north and Bottesford Beck to the south. The River Trent lies to the west, with a boundary line approximately along Grammar School Walk, Richmond Close and Winchester Drive to the east. Bottesford parish includes the hamlet of Yaddlethorpe, and Bottesford Moor. In the 2001 Census, Bottesford's population was recorded as 11,171, falling to 11,038 at the 2011 census. Bottesford is written in Domesday as "Budlesford", and until the 20th century it was a small farming village. Yaddlethorpe appears in Domesday as "Laudltorp". The Grade I listed Anglican parish church is dedicated to St. Peter ad Vincula. The church is Early English style and cruciform in plan, built on the site of an earlier Saxon church. It was restored in 1870; during restoration were found two Saxon sundials that were incorporated into the south porch. Local landmarks include Bottesford Beck, and Bottesford Preceptory where it is said that the Knight's Templar and later Knights of St John made a base. Byard's Leap (SK990494) was part of the Temple Bruer estate. Tea Pot Hall – formerly a meeting place for the elderly, since relocated. There is a library and medical centre on Cambridge Avenue. There are two Junior schools, Bottesford Junior, and Leys Farm Junior School. There is also one Primary school, Holme Valley Primary, on Timberland. The local secondary school, the Frederick Gough School, opened in 1960 as Ashby Grammar School. It became Bottesford Grammar School, then Frederick Gough Grammar School named after the first chairman of the school governors. It became comprehensive in 1969 when it joined with Ashby Girls' Secondary School, a secondary modern school on Ashby High Street. Other students travel to the nearby Melior Community Academy in Scunthorpe which has special links to the Leys Farm junior school. The ecclesiastical parish is Bottesford St Peters part of the Bottesford with Ashby Team Ministry of the Deanery of Manlake. The team vicar is The Revd Graham Lines. Whilst the two Methodist chapels recorded in 1872 have closed, in 2002 a new Baptist church was opened in Chancel Road, having been meeting in the Civic Hall since 1978. A civic hall is run by the Town Council for social events. A sports hall stands adjacent to the football and cricket pitches in Birch Park. ^ "Civil parish population 2011". Neighbourhood Statistics. Office for National Statistics. Retrieved 20 April 2016. ^ "Bottesford in the Domesday Book". National Archives. Retrieved 13 April 2013. ^ "Bottesford in the Domesday Book". Open domesday. 1086. Archived from the original on 5 May 2013. Retrieved 14 April 2013. ^ "Yaddlethorpe in the Domesday Book". Open domesday. 1086. Archived from the original on 5 May 2013. Retrieved 14 April 2013. ^ Historic England. "St Peter ad Vincula (1083014)". National Heritage List for England. Retrieved 30 June 2011. ^ Historic England. "Church of St Peter Ad Vincula (60792)". PastScape. Retrieved 14 April 2013. ^ Historic England. "Preceptary (60786)". PastScape. Retrieved 20 January 2010. ^ Ward, Penny. Dennis Mills (2nd ed.) (ed.). The Knights Templar in Kesteven (2 ed.). Heckington: Heritage Lincolnshire Publications. ISBN 978-0-948639-47-0. ^ Page, William, ed. (1906). A History of the County of Lincoln. Victoria County History. 2. pp. 210-213 'Houses of Knights Templars: Willoughton, Eagle, Aslackby, South Witham and Temple Bruer'. Retrieved 12 February 2011. ^ "Bottesford Library". North Lincolnshire Council. Archived from the original on 30 January 2013. Retrieved 14 April 2013. ^ "Bottesford Junior School". Retrieved 14 April 2013. ^ a b "Leys Farm Junior School". Retrieved 14 April 2013. ^ "Frederick Gough school". Retrieved 20 July 2009. ^ "Melior Community Academy". Retrieved 14 April 2013. ^ "Bottesford St Peters D C C". Diocese of Lincoln. 2011. Archived from the original on 7 April 2014. Retrieved 14 April 2013. ^ "Church web site". Bottesford with Ashby team ministry. 2013. Retrieved 13 April 2013. ^ Wilson, John Marius, ed. (1870–72). Imperial Gazetteer of England and Wales. Retrieved 14 April 2013. ^ "Bottesford Baptist Church". St Mark's church. Retrieved 14 April 2013. ^ "Bottesford Civic Hall". Lincolnshire county council. Retrieved 14 April 2013. ^ "Bottesford Sports Hall". North Lincolnshire council. 2011. Archived from the original on 15 March 2013. Retrieved 14 April 2013. Wikimedia Commons has media related to Bottesford, Lincolnshire. "Bottesford local history pack". North Lincolnshire Council. 2011. Archived from the original on 16 April 2013. Retrieved 14 April 2013. This page was last edited on 16 February 2019, at 22:47 (UTC).